Multi-carrier modulation, in particular Orthogonal Frequency Division Multiplexing (OFDM), has been successfully applied to a wide variety of digital communications applications over the past several years. Although OFDM has been chosen as the physical layer standard for a diversity of important systems, the theory, algorithms, and implementation techniques remain subjects of current interest. This is clear from the high volume of papers appearing in technical journals and conferences. 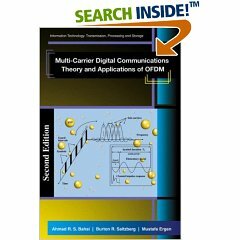 Multi-Carrier Digital Communications Theory and Applications of OFDM, Second Edition Multi-carrier modulation, Orthogonal Frequency Division Multiplexing (OFDM) particularly, has been successfully applied to a wide variety of digital communications applications over the past several years. OFDM has been chosen as the physical layer standard for a variety of important systems and its implementation techniques continue to evolve rapidly. This book is a valuable summary of the technology, providing an understanding of new advances as well as the present core technology. A unified presentation of OFDM performance and implementation over a wide variety of channels, including both wireline and wireless systems, is made. This will prove valuable both to developers of such systems and to researchers and graduate students involved in analysis of digital communications. In the interest of brevity, the authors have minimized treatment of more general communication issues. There exist many excellent texts on communication theory and technology. Only brief summaries of topics not specific to multi-carrier modulation are presented in this book where essential. As a background, it is assumed that the reader has a clear knowledge of basic fundamentals of digital communications. Highlights of the Second Edition During the past few years since the publication of the first edition of this text, the technology and application of OFDM have continued their rapid pace of advancement. As a result, it became clear that a new edition of the text would be highly desirable. The new edition provides the opportunity to make those corrections and clarifications whose need became apparent from continued discussions with many readers. However, the main purpose is to introduce new topics that have come to the forefront during the past few years, and to amplify the treatment of other subject matter. Because of the particularly rapid development of wireless systems employing OFDM, the authors introduced a section early in the text on wireless channel fundamentals. They have extended and modified their analysis of the effects of clipping, including new simulation results. A section of channel estimation has been added to the chapter on equalization. The chapter on local area networks has been greatly expanded to include the latest technology and applications. Three totally new chapters are added, on OFDM multiple access technology, on ultra wideband technology, and on WiMAX (IEEE 802.16). Organization of This Book The authors begin with a historical overview of multi-carrier communications, wherein its advantages for transmission over highly dispersive channels have long been recognized, particularly before the development of equalization techniques. They then focus on the bandwidth efficient technology of OFDM, in particular the digital signal processing techniques that have made the modulation format practical. Several chapters describe and analyze the sub-systems of an OFDM implementation, such as clipping, synchronization channel estimation, equalization, and coding. Analysis of performance over channels with various impairments is presented. The book continues with descriptions of three very important and diverse applications of OFDM that have been standardized and are now being deployed. ADSL provides access to digital services at several Mbps over the ordinary wire-pair connection between customers and the local telephone company central office. Digital broadcasting enables the radio reception of high-quality digitized sound and video. A unique configuration that is enabled by OFDM is the simultaneous transmission of identical signals by geographically dispersed transmitters. And, the new development of wireless LANs for multi-Mbps communications is presented in detail. Each of these successful applications required the development of new fundamental technology. Finally, the book concludes with describing the OFDM based multiple access techniques, ultra wideband technology and WiMAX.